Have you ever dreamed of interviewing a band for Rolling Stone Magazine? Well, that’s exactly what music-lover William Miller gets the opportunity to do in Almost Famous. Billy, a teenage journalist, follows an unpredictable band named Stillwater on their concert tour, interviewing them for Rolling Stone–his big break. He gets into some pretty insane situations that include dealing with love, fangirls, and his crazy over-protective mother. I LOVE this movie! It basically depicts my dream job, and shows the importance of music in people’s lives. My favorite scene in the movie is when William is on the tour bus with the band, and they all start singing along to Elton John’s “Tiny Dancer.” Watch the scene HERE & check out the movie trailer HERE! This is my favorite movie of all time–it sparked my love for music at 1o years old, and since then I’ve seen it over 100 times. No joke. 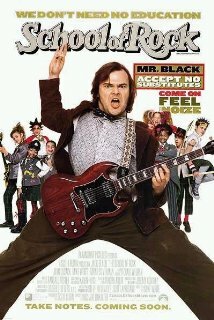 The story follows Dewey Finn (AKA Jack Black, my favorite actor), a guitar-playing, wannabe rock star in his quest to earn some cash to pay off his rent. After being kicked out of his former band, “No Vacancy,” he takes a job as a substitute teacher…even though he can’t teach. As he forms the 5th grade class he’s “teaching” into a rock band, (set on winning Battle of the Bands for the money) some crazy things happen. This movie is hilarious, and the soundtrack features some old favorites everyone loves, including Stevie Nicks’ “Edge Of Seventeen,” Cream’s “Sunshine Of Your Love,” and Led Zepplin’s “Immigrant Song.” Check out the movie trailer HERE! 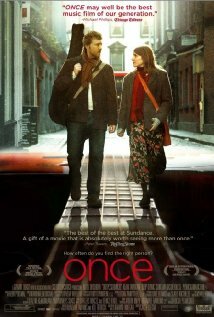 Once is a perfect movie for sentimental music-lovers. This adorable film follows an Irish busker and a Czech immigrant who begin to record songs together, and of course, fall in love. After the movie came out in 2007, it’s been made into a musical. The soundtrack to this movie is amazing. My favorite song from the movie is called “Falling Slowly,” which you can listen to HERE, and watch the movie trailer HERE! Not only is the music and idea behind this movie amazing, but the film itself will have you on the edge of your seat. 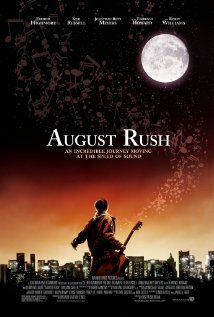 The story is about Evan Taylor, a young music prodigy and orphan who runs away to New York City. There, he uses his connection and passion for music to find his birth parents, Lyla and Louis. Along the way, he joins a group of homeless children who are taught music and trained to be street performers by a man named Wizard. I obsessively listen to the soundtrack of this touching movie. My two favorite songs in the movie are “This Time,” which is performed by Evan’s dad and his band in the movie, (played by Jonathan Rhys Meyers) and “Something Inside,” also performed by Jonathan Rhys Meyers. Watch the movie trailer HERE!